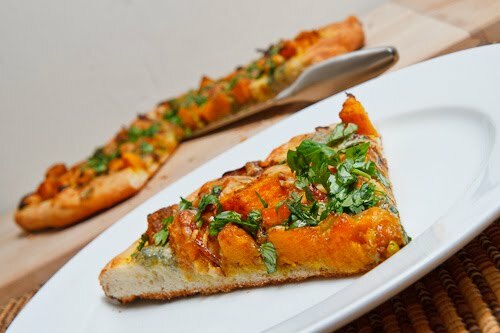 Curry and butternut squash are two of my favorite foods and when I came across a a recipe that combined them in a curried butternut squash naan pizza on The Life & Loves of Grumpy’s Honybunch I bookmarked it right away. The pizza was topped with curried roasted butternut squash along with caramelized onions and cheese and it reminded me a lot of the roasted butternut squash and caramelized onion pizza with gorgonzola and crispy fried sage that I enjoy so much. With the thoughts of both of those pizzas dancing in my head I decided to combine them and make a curried roasted butternut squash pizza with caramelized onions and gorgonzola. You really can’t go wrong slowly roasting butternut squash into little sweet and tender cubes of melt in your mouth goodness and currying them was a great idea. For the caramelized onion ‘sauce’ I added some more curry powder along with some common curry ingredients including garlic, ginger and a chopped small green chili for some extra heat. I then topped the pizza with some mozzarella and gorgonzola and I finished it off with a generous helping of cilantro when it came out of the oven. 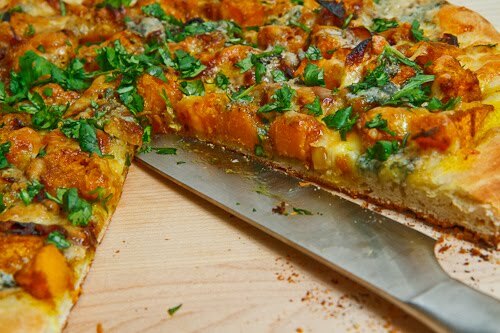 The curried roasted butternut squash pizza with caramelized onions and gorgonzola was amazing! Butternut squash can be nice and sweet and that sweetness went really well with the heat of the curry. The curry flavour also worked well with the butternut squash, the caramelized onions and the creamy and tangy melted gorgonzola took it to a whole new level! Fresh herbs can work well on a pizza and the fresh chopped cilantro was the perfect finish to this pizza. Toss the butternut squash in the curry powder with the olive oil to coat. Roast the squash in a preheated 400F/200C oven until tender, about 30 minutes and set aside. Meanwhile, melt the butter in a pan. Add the onion and cook on low until caramelized, about 30 minutes. Add the garlic, ginger, green chili and curry powder and saute until fragrant, about a minute. Add the broth, deglaze the pan and simmer to reduce a bit. (You want it a bit liquidy as this will be the pizza ‘sauce’. Spread the onions over the pizza dough followed by the butternut squash and the cheese. Yum! This flavor combo sounds out of this world! I still need to conquer making my own pizza dough. Breads scare the hell outta me! I love curry too! I never thought to use it on pizza with butternut squash This is fabulous!!! Hi Kevin! Just realized I haven't stopped by in a while. Interesting pizza – I may try it – sans the onions! This looks and sounds very tasty, my mouth was watering as I read your description. This is a pizza I will certainly be trying as it has all the elements of food that I enjoy. Now there is a pizza top that is totally new to me…..but the butternut and Gorgonzola has me on the edge of my seat. Very original! That beautiful pizza must taste so good! This looks sooo good and sounds absolutely delicious! I still have a butternut squash laying around, now I know just what to do with it! At it again with the gorgonzola again I see. Nice one! I love the stuff. Possibly my favorite cheese and such a good pizza topping. This is a such a refreshing and interesting vegetarian pizza! Awesome! What an interesting addition with the curry. I would have never thought of pairing it with gorgonzola. Caramelized onions and squash though have long been one of my favorite combinations. The only thing I'm always careful of, like you've done, is to find something to balance out the sweetness. This looks totally dreamy. It's amazing how well butternut squash goes with a good creamy cheese. Truly, they were born for each other. just another yummy looking comfort food recipe!Thanks for sharing.. I never thought to put squash on pizza…thanks for the idea! This is one of those recipes where I wish I had time to savor the art of cooking. My cooking tends to be fly by the seat of my pants and get on the table as quickly as possible. Ideally I would love to have all the time to make my own crust, roast the squash, slowly caramelize the onion. Mmmm, lovely thought. I must make this as soon as I have a bit extra time! The sweet butternut squash with the sweet onions must pair so well with the tang of the gorgonzola. Lovely pizza! Beautiful photo. I love your creativity with flavours! wow looks and sounds amazing! Great idea adding curry powder. Looks lovely and hearty. Nice meal. Please come over instantly with all these ingredients and prove that you and your recipes are not just a wonderful fantasy. It can't be far. We're in Toronto, too! I am always up for trying new pizza topping combos–this sounds divine! Oh; this is for me! I make a thin crust pizza with pumkin or squash with blue cheese, but the addition of caramelized onions must be terrific. Next time, for sure! This is so creative, I love all of these ingredients. I just never thought to put them all together on my most favorite thing – pizza! I love that you label the onions as "sauce". Great idea! it's official – you are killing us here!! Butternut and gorgonzola are such a happy marriage – I just never thought of having them on a pizza before! Very clever. Beautiful photos! I'm always on the look out for new and different types of pizza. This looks simply amazing! I agree with the above comment that butternut and gorgonzola are an absolutely orgasmic combination. As a huge fan of pizza (particularly home made) I am dying to give this a try. thanks for sharing – I love the images by the way. This is very similar to a pizza I make quite often, the only changes being that when I roast the Butternut Squash is that I also add a little balsamic vinegar to the roasting pan. This helps the onions and squash caramelise beautifully. I have also in the past roasted different vegetables to go on the pizza… things like new asparagus, cherry tomatoes, zucchini or eggplant. Thanks for sharing! Hm This pizza looks so tasty! I can not wait to make one. Looks like a good veggie pizza.